Secret of the Dragon is the second book in the Dragonships of Vindras series. If you enjoyed reading the first book in the series, Bones of Dragons, you will not be disappointed with Secret of the Dragon. While Secret of the Dragon explains itself quite well, it is not a standalone novel. I would suggest reading Bones of Dragons first, and be ready for more. The Dragonships of Vindras is to be a six-book adventure, so if you are into epic fantasy, this series may be what you are looking for, but be warned, at the time of this review only two of the books are in print, and these books don’t tie things up nicely on the last page. You will be waiting for next book to find out what happens next. 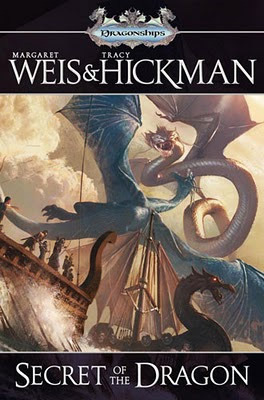 Margaret Weis and Tracy Hickman weave an epic tale, combining a Viking-like people, their dragonships, and their lore, with other religions, politics, magic, and a glimpse into the affairs of dragons and of the gods. The characters in these novels grow and learn as the story progresses. These first two novels are rich with lore and history, but they never seem to get bogged down in it. There is action and adventure around every corner. Our lead character, Skylan Ivorson, is a young and proud warrior chief of the Vindraisi, but at the start of Secret of the Dragon, things have not gone well for him or his gods. There are new gods warring against the Vindraisi gods, and new and old foes have attacked the Vindraisi. Skylan was high chief, but now his dragonship and crew have been captured. They are to be taken to Sinaria to be slaves and fight in the Para Dix for the entertainment of the Sinarians, their Empress, and their god. Skylan needs to win back the respect of his men if they are ever to get back to the Vindraisi homeland. This is where the novel Secret of the Dragon starts. I judge a novel as good if it pulls me in and makes me care about the characters and the events that take place. Secret of the Dragon did that for me. It also made me cheer, and it made me cry. When my tears fill my eyes so much that I can’t see the next line, I know the story has made its characters seem real. If you are one of those people who can’t wait to know what will happen next, you may want to wait until all of the novels in the Dragonships of Vindras series are in print. Originally published in Neo-opsis issue 20.